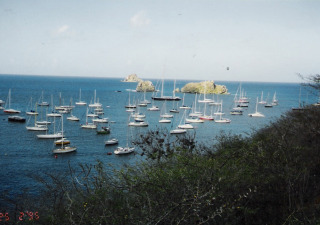 Not all anchorages are this crowded... this was taken off Gustavia harbor on St. Bart's... There is safety in numbers... being around a bunch of other boats is an obvious way to stay safe while living aboard a sailboat. That is not to say that you cannot be safe if you are by your lonesome in a secluded anchorage... we anchored for one week all alone in a secluded cove off the coast of Venezuela and had no problems whatsoever. Note the high freeboard on Shadowtime...it was 4 to 5 feet from the rail to the water... this makes it very difficult for any bad guy to get on the boat easily. Remember bad guys take the path of least resistance and having your boat difficult to get onto while anchored, will make your boat a less likely target. Having a stern swim platform sure makes it easy to get on and off your boat... and almost all charter boats have them... they just may not be a good choice when choosing a cruising sailboat. This is a very personal decision and it depends on how comfortable you are having firearms aboard your boat. If I had to guess I would say it was split 50-50, guns versus no guns...for the sailboat cruisers that we encountered. If you do choose to have a firearm the board... that is one of the first things you will be asked on the customs and immigration form that you fill out for each island. 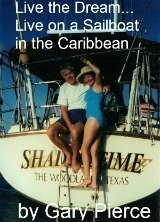 We had to get extra pages for our passport, after two years of cruising... there are that many islands and you have to go through customs and immigration many many times while living aboard a sailboat in the Caribbean. If you do have firearms, you are supposed to turn them into the police, and they will be returned to you when you leave the island... so having a firearm on board, puts you in violation of the laws and regulation of that particular island. So it your choice... we never heard, in our eight years of cruising the Caribbean, of anyone using or having to threaten to use a firearm... but it's your choice. The easiest way to keep your dinghy from being stolen while anchored is to haul the dinghy out of the water. We pulled our dinging out of the water, using dinghy davits, every night... it was not only safe but also made the boat quieter... aging tethered behind your boat will make annoying noises as the waves lap against the dinghy hull. 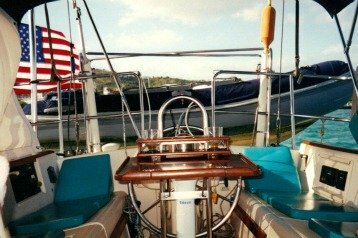 Even though our dinghy was 250 pounds, my wife and I could easily pull the dinghy out of the water using the block and tackle... you can see a good example of the davit system at frugal sailboat living.